Pets are coming and going at a record rate. Often, Americans who relocate to another country do so on a temporary basis. Your company or government agency employer transfers you for a year or two, or your family simply wants to experience a foreign lifestyle. At some point, it’s time to return to America. We also take dogs, cats, and even other pets on international vacations. And, of course, people from all around the world move to the US, too, bringing pets with them. So, how do you bring your pet into the US? 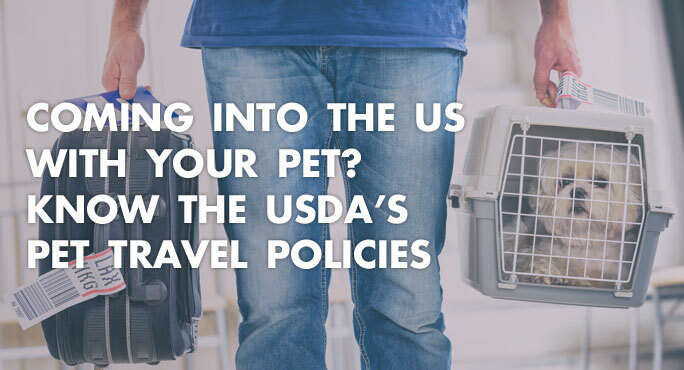 The US Department of Agriculture’s Animal and Plant Health Inspection Service (APHIS) and the Centers for Disease Control (CDC) both regulate cats, dogs, and other pet animals entering the country. However, many individual states also have health-related rules you’ll need to follow. You can check on that by visiting the USDA’s page for dogs or cats and clicking on your destination state from the drop-down menu. USDA/CDC rules depend on where your pet has been living. If you don’t comply with these import requirements, there will be delays and headaches when your pet tries to enter the country. As previously noted, though, the requirements are straight-forward. Although the Veterinary Services division of USDA/APHIS does not require a general health certificate or a rabies vaccination certificate, the CDC reserves the right to visually inspect your kitty at her port of entry. The CDC’s primary concern is infectious diseases that can be transmitted to humans. For pet dogs, no paperwork is required, unless you happen to be coming from a country where screwworm or Foot and Mouth Disease exist. The certificate must be signed by a local, full-time, salaried veterinary official. To prevent importing Foot and Mouth Disease, you are asked to clean your pet’s feet, fur, and bedding before you depart. Once you reach your final destination, you should bathe your dog again and keep him away from any livestock for at least 5 days. You can find lists of countries where screwworm and Foot and Mouth Disease are a problem here. Regardless of government regulations, every airline has its own rules about pet transport – what breeds are acceptable, where they can ride on the plane, and so on. Many airlines have recently revised their rules, including redefining what constitutes an allowable “emotional support animal.” For example, you can read about United’s changes here. If you are returning to the US with a dog or cat, it’s possible your pet will have to travel as manifest cargo, no matter how she traveled leaving the US. That’s especially true if she flew as checked baggage before. It is critical to double-check with your airline about their current requirements. The Transportation Security Administration (TSA) requires that all pets coming into the US as manifest cargo travel under the auspices of a professional pet transport company such as Starwood Animal Transport. Getting professional help with your pet’s move is nearly always a confidence booster, whether your airline requires it or not. Let’s face it. You have a lot on your mind, and even though the paperwork required to bring your dog or cat into the United States is minimal, the rest of his or her travel arrangements won’t be simple. With our Starwood team on the job, you can focus on relocating the humans in your family and the joyful reunion you’ll have when you and your pets are all on the ground in the US.